I have just found a nail polish that I absolutely love and have to share with everyone who will listen. 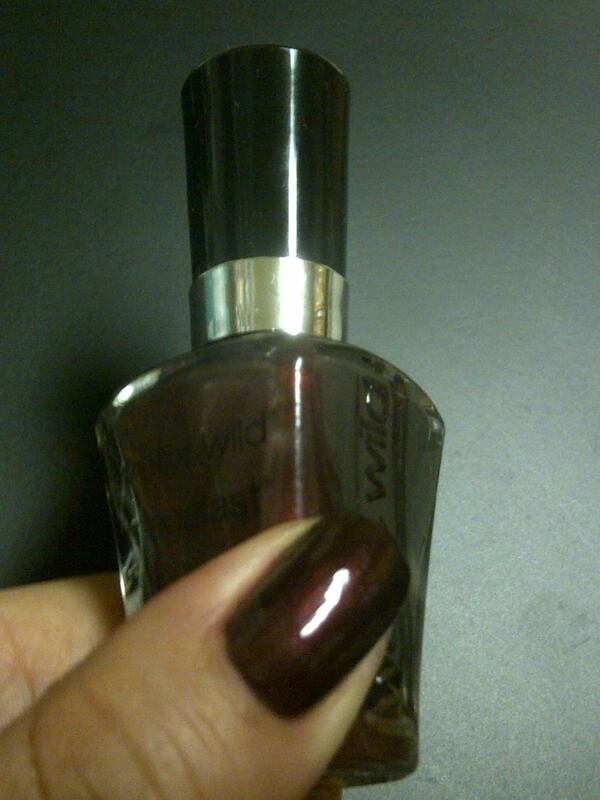 I have been hearing girls sing the praises of the Wet N Wild Megalast Salon Nail Color for quite a while. I don’t know what took me so long to give them a try. Here is a little background info on my nails. I used to bite them pretty badly right up to high school. 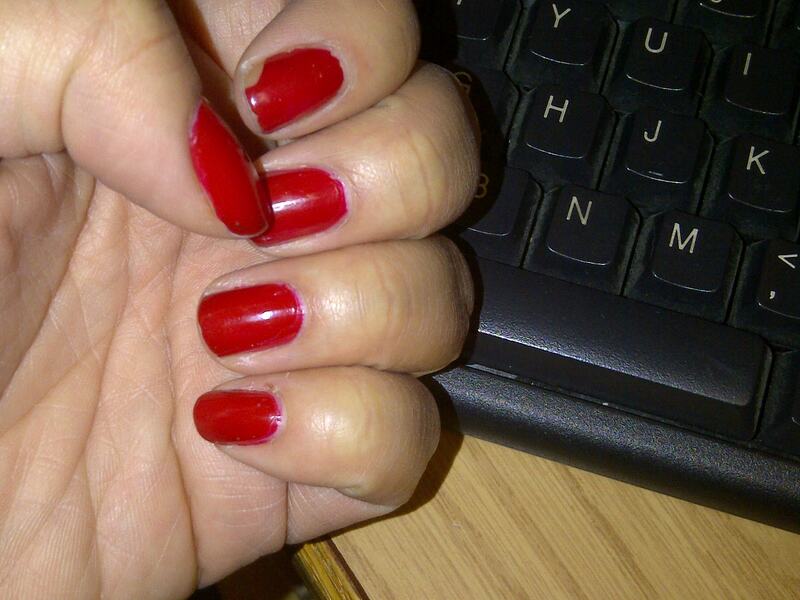 Then, I got horrible acrylics that made my nails soft and weak but helped me to kick my biting habit. When I stopped using acrylics as a teenager, my nails eventually got really strong, long and healthy. I recommend Sally Hansen’s Diamond Strength or Nail Tek Intensive Therapy to anyone looking to do this. My nails are not prone to splitting or peeling, and they grow very quickly. I wear them polished most of the time. My friend and nail polish guru, Carie often gasps when she sees me sporting the elusive nn (naked nail). I change my polish color every few days. I get sick of one color or design pretty quickly and the materials handling at my job makes for a lot of polish chips. That brings me back to Megalast. One of my very favorite shades, OPI Big Apple Red was getting a little on the goopy side , so I decided to pick up the Megalast red called I Red A Good Book This is a classic cherry red with a vinyl finish and zero shimmer. I was really happy with the manicure I gave myself with this polish. It has a super wide brush called the manicurve that makes painting so easy (It may not be so great for girls who don’t have a wide nail bed like I do). It dried fairly quickly too considering I couldn’t find my Seche Vite (the holy grail of all topcoats). Do ignore the messy bits on my freshly painted fingers. The finish on the Megalast polish is beautiful and shiny and it remained that way the entire time that I have had it on my nails. I Red a Good Book looks exactly like a UV gel color does on my nails. I have had this polish on my nails for…wait for it…six days. A nail polish never, ever, ever lasts that long on my nails without chipping. My nails actually started to grow out from the bottom before they started to chip from the top. Unheard of. Now, I’m not sure if the whole line is this chip proof or if it just happens to be this color. I often find that a particular color will be tough as nails, and another in the same line can be really peel and chip prone. It must have something to do with the formulation difference in different pigments. As far as Red a Good Book Lately goes, I am truly impressed. Want to hear something truly ironic? While I was typing this review, I banged my finger on the keyboard and chipped the polish. HA! Spot the sad, chippy nail. The very best part about this polish is the price point. It is a mere $2.40 at Wal-Mart. Can we have a slow clap for that? Great value since that is a fraction of the price of polishes like OPI and Essie, and this wears just as well, if not better. After my dream week with Red a Good Book Lately? , I bought some more colors to test drive. 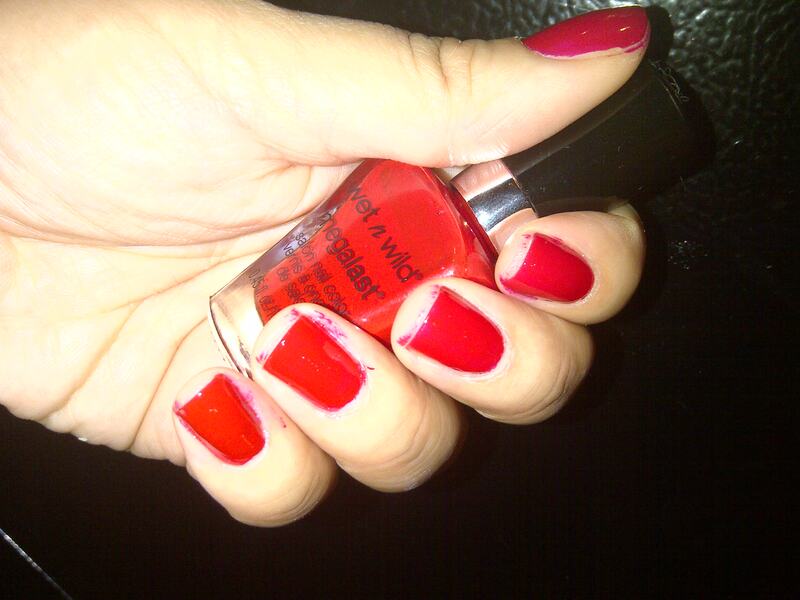 I will definitely repurchase Wet N’ Wild Megalast Salon Nail Polish. It is easy to work with, looks beautiful on, and you can’t beat the price. The color selection is diverse and beautiful. I think I just may be starting a collection of these gems. Have you tried these polishes? What did you think? I love this last one darl choco color. lovely ! I adore the “Under Your Spell” color. Bite The Bullet looks like the perfect smoky purple I’ve been searching for! I love that it is completely opaque, but has a gorgeous shine. Hi Soph! Run , run, run…I had to go to 2 diff stores to get the colors I had my eye on. They are pretty picked over at some locations. Thanks Vann-Ly…|I actually dont really no alot to maintain my nails besides a good nail hardener. Sometimes Ill use one of those buffing blocks to smooth them out. Seche Vite is the best topcoat I have ever tried. |It dries soooo fast. By the time you’re done painting your last nail, the other 9 are dry! Bite The Bullet, try it! I tried this once agessss ago with comic strips!